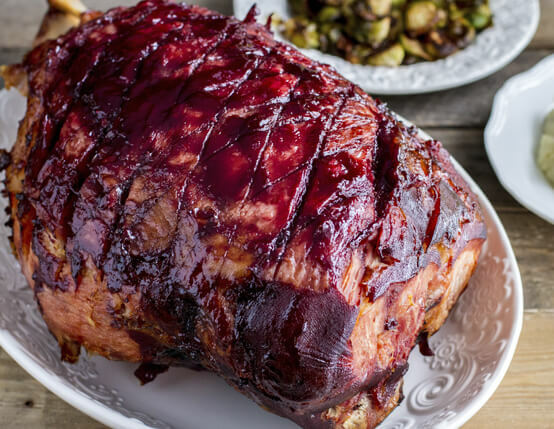 Ready to update your standard ham glaze recipe? 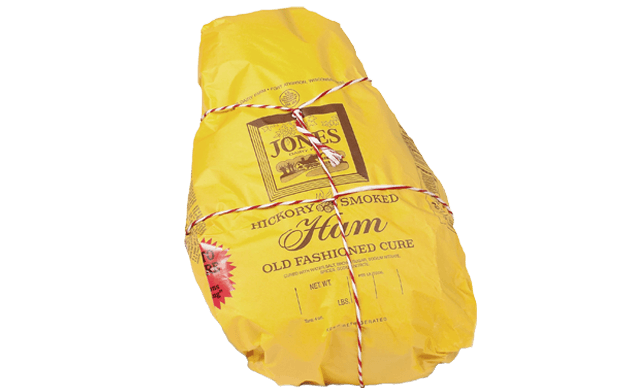 Tart raspberries and peppery chipotles highlight the subtle smokiness of Jones Hickory Smoked Ham. Set frozen raspberries in fine-mesh sieve over a large bowl and let thaw. Once thawed, mash pulp through sieve to puree raspberries, leaving seeds in sieve. Discard seeds and add maple syrup, honey, lime juice, chipotle pepper sauce and chili pepper paste to the pulp. Whisk to blend. Transfer to medium saucepan. Heat over medium heat and cook until reduced, about 5-10 minutes, whisking frequently. Set aside. 30 minutes before ham is done, score surface of ham in diamond pattern, remove skin (if a bone-in ham) and brush on glaze. Return to oven to finish baking, uncovered.